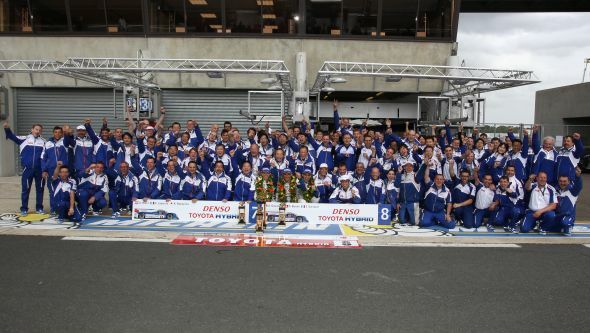 This year’s 24 Hours of Le Mans was a roller coaster race that saw the Toyota Racing team and drivers overcome immense challenges, leading to an emotional runners-up finish. 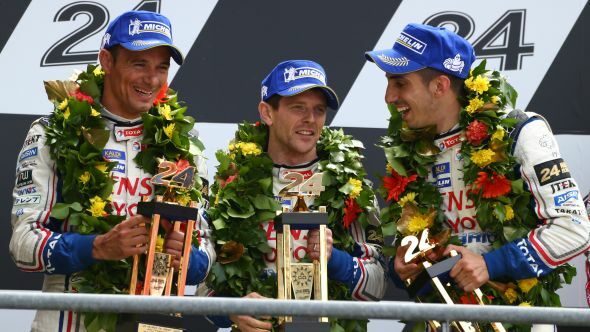 The #8 TS030 Hybrid of Anthony Davidson, Sébastien Buemi and Stéphane Sarrazin finished in second place, while the #7 of Alex Wurz, Nicolas Lapierre and Kazuki Nakajima completed a satisfying week for the team by taking fourth position. The chaotic race was marked by highly changeable weather, resulting in treacherous track conditions and eleven safety car periods. The #7 Toyota faced several challenges, including a loss of fuel pressure early in the race, a slow in-lap to conserve fuel, and two precautionary tyre changes when sensors indicated slow punctures. Then with just an hour to go, the TS030 Hybrid was in a thrilling battle for third until a very heavy rain shower made track conditions virtually impossible. Driver ‘Nico’ Lapierre could do little to prevent his car sliding off the track and into the barriers. Nevertheless, he managed to limp back to the pits, where within 30 minutes the crew had done a superb job repairing the heavy damage to the front bodywork and suspension — all of which allowed Nico to get back on track and take the chequered flag in fourth place. The #8 Toyota enjoyed a much smoother run despite the difficult circumstances, losing time only when two fuel stop windows coincided with separate safety car periods. This meant Stéphane had to be held at the end of pit lane until he could rejoin. 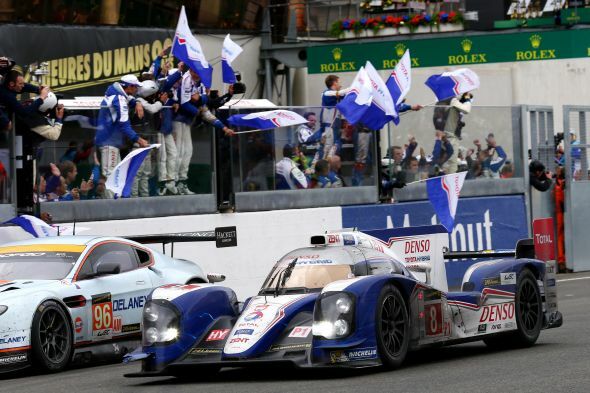 Otherwise, the TS030 Hybrid enjoyed perfect reliability that saw it push hard for victory, before eventually completing the 24-hour race just one lap behind the winning Audi #2. Great job Toyota, but this makes us expect no less then a win for next year or there will be a lot of dissapointment. Porsche will be there next year and they won’t make it easy. Toyota need this victory, and we are behind you guys!! !